You can see other specs on the gun by visiting FN's FNAR page. The model I purchased was their FNAR Standard Autoloading Rifle which is the one with a 20" light barrel and a 20 round clip. The outside of the box shows "FNAR LIGHT 20 TIROS" and another sticker on the box had "FNAR LIGHT 20IN 20RD". In my next several posts, I'm going to try to talk about each item and provide detail and photos. If you have any questions or want more detail, just ask and I will update the post with more detail if possible and additional photos. OK, I purchased it, so I'm a little biased, but I believe that this gun is awesome for my purpose. 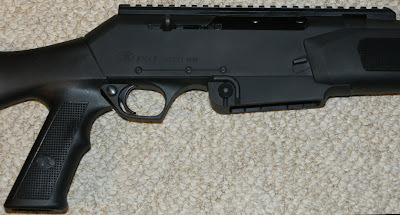 I have always wanted one of those Browing BAR, but struggled buying an autoloading rifle for hunting. 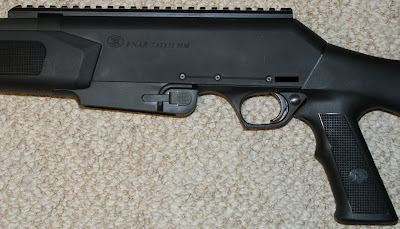 The FNAR took what was great about the BAR and integrated it with features that make it a true multi-use gun. By multi-use, I mean that you can take it to the field hunting, to the range shooting, to a Shootarama impressing, and to a situation protecting if the need arises. I have read some other web sites and they have given this gun a hard time about being ugly. Personally, I think that simplicity is beautiful. They took a proven design (BAR) and added large capacity magazine capability, control and feel of a pistol grip, and three rails on the forearm to give it a huge amount of versatility. The photos below show these features in more detail. In one of the photos, I put a black rectangle over the serial number (FYI). The gun feels solid and shoulders great. The action is smooth as silk, which you would expect since it was based on the BAR. The magazine locks in place and feels solid. With a push of the button, it will drop out with no problem. 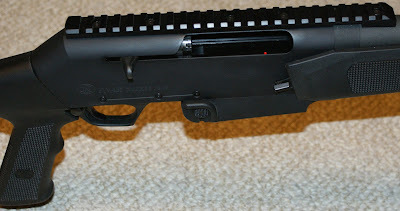 It has a cross bolt safety just behind the trigger and has a good feel, just like a hunting rifle should. The trigger is a two stage trigger which seems to have a little travel initially, but then is crisp at about 5 pounds. everything I have found indicated that the trigger will be set somewhere between 3.25 and 5.5 pounds and is not adjustable. I will try to measure the true trigger weight in the near future. After looking at all the details, my only complaint is not with the gun, but the place I purchased the gun. This was their last one and it has very small marks on the plastic where you could tell it must have bumped into other guns on the shelf. I purchased a FNAR from Nick's Guns & Range in Marietta, Georgia. I feel like I got a great price on the gun, considering I purchased it locally ($1299) plus a $150 rebate from FNH. This is a .308 Winchester (5.62x51) semi automatic rifle with a 20" barrel. Basically it is a Browning BAR with a pistol grip, 20 round clip and three rails on the forearm. Many people have said they think it us an ugly gun, but in my mind, it may be the most practical gun and attractive rifle ever made. It includes the comfort of your favorite sporting rifle with the versatility of an assault rifle (not that I need that every day, but it is nice to have as backup). I will put some detailed photos in on my next post.